Why should you buy rare coins? Most people are more familiar with stocks, bonds, bullion, real estate, and many other popular investments. So why learn what you must know about a field that is seemingly complicated? The answer is: First, rare coins are really not any more difficult to understand than CD’s, stocks, or bonds. Second, when held for their recommended holding period of three to five years rare coins can pose as an excellent opportunity for financial security. When comparing rare coins to better known assets, rare coins may be at the forefront of appreciation winners. Moreover, rare coins have always served as a defense against economic uncertainties, especially inflation. K. Smaltz Inc. provides excellent guidance in the rare coin and precious metal arena. With over 25 years in the business, Ken Smaltz is a solid advisor who has the expertise to value, build or sell a collection. He prides himself on recognizing investment potential, understanding a collector’s needs and having the network that can provide for all levels of client. Each grading service publishes a monthly “Population Report” that records the number of coins certified in each grade for every coin. This report has now become a key tool in helping collectors determine how rare a coin is. The two major grading services, PCGS and NGC, are nationally recognized and independent. Together they have certified more than $10 billion in rare coins. In addition to adding value to coins, the grading services have increased overall liquidity and protection by encapsulating each coin in a tamper-resistant plastic holder with it’s individual numbered certificate. The encapsulated coins are so secure that they now trade over the telephone sight unseen. Now, let’s talk about the existing coin supply. Most rare coins were minted before the depression. In 1933, gold coins were minted for the last time as far as general circulation. At that time, then President Theodore Roosevelt instituted a higher price for gold, therefore gold coins became worth more in weight than for their face value. Thus, it was no longer feasible for the government to produce gold coins for circulation. Silver coins were produced until 1964 when they were also discontinued. In the year 1918, the Pittman Act called for the melting of some 270 million Morgan Silver Dollars. There were also other government actions that were responsible for the destruction of tens of millions of coins for their bullion content removing more mint state coins from existence. So, today from the original number of coins that were minted prior to the year 1933 it is estimated that fewer than 1% of these coins exist in what we call uncirculated mint state condition. So, in essence of the remaining coins available in the market today, only a small percentage of these coins are considered investment quality. Each day as more and more of these coins are scoffed off the market the quantity begins to diminish. Some find their way into long term portfolios, endowment funds and of course museum collections. While this kind of activity occurs, the high quality coins are going to diminish from the market and therefore the prices for these rare coins will rise. Never clean your coins. A coin that has been so abrasively cleaned that it now has scratches or hairlines, and has lost its luster will rarely be worth anything more than half its original value. In coin collecting numismatists tend to take the old fine wine approach. That means they value and appreciate coins that show their age. Get a sound advisor. The coin market and values fluctuate, so it is always best to get a reputable advisor who can value the coin and assist in it’s sale. 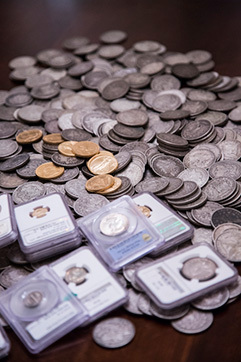 There are many factors that influence the coin market such as the rare coin collector. The true coin collector has a passion for rare coins. Whether it is for a particular coin or a key date coin to complete a set in a collection. The rare coin collector has an impact on the market by taking advantage of buying coins when prices are low, which causes prices of rare coins to rise with supply and demand. When prices are down the investor will hold his portfolio of coins, waiting for the appropriate time to sell. If he is wise, he will acquire additional coins at a lower price. The hopes of the investor is an upward move in coin prices, especially in times of inflation when the value of paper money has eroded. The rare coin investor knows he is protected with a proven inflation hedge which will protect his assets. It is also true that many investors will become collectors as well. Bullion is the pure form of a precious metal such as gold, silver, copper, or platinum, from which coin metal alloys are made. U.S. coins made of bullion are not intended for general circulation; they are made for the purpose of investing in precious metals. They both fluctuate daily with the price of the metal they contain. Coins can also react to the rise and fall of bullion prices, but the value of rare U.S. coins is vested not only in their bullion value, but also in their scarcity and condition. To explain supply and demand a little further imagine the collector and investors presently in the coin market. Now, imagine the new collector, investors being introduced into this market through the money managers, financial planners, etc.. Coin supply in simple terms means you have only a specific quantity of coins available. Now take demand into the scenario and realize that as this demand grows this already small quantity of coins diminishes even thinner as more and more collectors and investors acquire these coins, thus creating an upward cycle in the prices of rare coins.